Kitchens have become the focal point and the gathering place in our homes. Beauty and functionality go hand in hand. A decorative open cabinet can add that one element that pulls it all together. Cabinet companies offer a great selection of open cabinet solutions from a variety of wine cabinets to bookcases to plate racks and knickknack shelves. 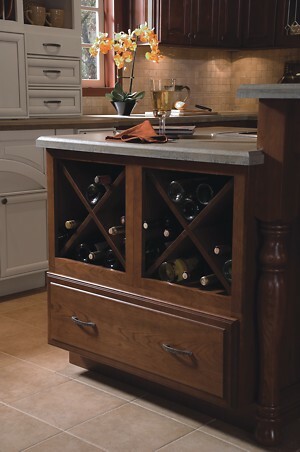 A lot of homeowners are looking to include an area to display wine. These units come in a few different arrangements, square 6-inch “cubbies” that come in various lengths and hold 4 to 6 bottles, crisscross units that hold somewhere around a dozen bottles, one bottle in each space and large crisscross units that have just 4 large spaces that hold many stacked bottles in each opening. Having this many options makes it easy to be creative and find the best solution. Not everyone has the space to create a wet bar, but creating a “mini bar” with the wine cubbies under a cabinet that displays wine glasses is often a great solution when space is tight. Another design idea has the wine stored at the base cabinet level in an island or at the end of a peninsula – though traffic patterns and whether it’s creating a hazard to young children needs to be considered, as wine bottles tend to stick out an inch or two beyond the counter top. Open bookcases come in as many sizes and configurations as you can imagine. They can be used to display your cookbooks and/or your collectibles with both beauty and functionality. An open cabinet with a decorative valance over the refrigerator is a nice alternate to what is sometimes a forgotten storage area – too high and too deep to be of any functional use. Knickknack shelves come as small as 6” wide and are a great solution when a regular wall cabinet won’t fit on either side of a window. Open angled end cabinets are a great way to transition from the kitchen to the next room in an open floor plan.